This new four CD box set assembles a number of live releases. While it's credited as Samson, technically not all of it is that band. All of this music showcases the talent of Paul Sanson, though. He was essentially the heart of the band Samson, so it's a reasonable argument to make. 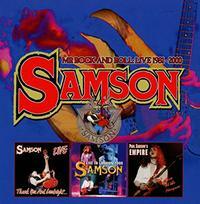 The band Samson was part of the NWOBHM. I remember hearing about them, mainly because Bruce Dickinson had been the singer before he joined Iron Maiden. It should be noted that he's not on these recordings. I don't think I've ever actually heard this band before, but this is quite cool. Not all of this is heavy metal, but three of the four discs mostly qualify. There is quite a range of sound within these CDs. I really like this quite a bit. I should mention that the abbreviations on the disc (including in the title) do not have periods, but I've added them simply because it annoyed my inner editor. 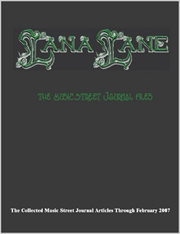 This review is available in book format (hardcover and paperback) in Music Street Journal: 2018 Volume 1 at lulu.com/strangesound. The extended introduction here includes some smoking hot guitar work. The cut works out to something that's part 80s metal and part hard-edged rock and roll like Motorhead. The vocals almost bring a sound not far removed from Molly Hatchet. A screaming hot, fast and furious rocker, this one also makes me think of Motorhead a bit. There is less of that 80s metal thing. I can make out some WASP here, too. The guitar solo actually makes me think of Ritchie Blackmore just a bit. I love the riff driven section that opens this number. The vocals really do make me think of WASP. This is a killer rocker with some great meat on its bones. This comes out as a more melodic, mellower tune. It has a lot of that 80s metal sound in the mix. It gets into more hard rocking stuff later in the piece. Here is another screaming hot metal stomper. It has a catchy chorus hook. This comes in with a full balladic form. As it works out it becomes a power ballad styled number. It has a nice balance between more rocking and sedate material. It's only a little over a minute and a half, though. This feels like it came out of the previous cut in some ways. It's a screaming hot metal stomper. It's another that makes me think of Motorhead a little, but I can also make out some Iron Maiden on this. The guitar soloing is quite soaring. There is an extended guitar solo segment at the end of the number, too. The rhythm section brings this number into being. It eventually works out to more of a melodic rocking number. Still, it has plenty of metal crunch in the mix. Here we get another fast paced metal stomper. This is great stuff. It has some killer riffs and a great sound to it. There is a Van Halenesque guitar solo segment at the end of this. I love the mean guitar sound on this stomping hot number. Starting acapella, the rhythm section joins after that. It works out to a cool, melodic rocker that has a lot of crunch in the mix. There is some feedback on this number that takes away from it. Beyond that it's a meaty, driving (pun intended) rocker. A fiery riff starts this, and the band is introduced as it drives forward. They take it out into the song proper from there with more of that tasty riffing. This number almost feels like it has just a bit of Chuck Berry in the mix. The instrumental section mid-track gets a little tedious. When the vocals join back in and they move it forward it recovers nicely, though. The keyboard sounds at the start of this are very dated, but when it fires out to the incendiary guitar rock it's all killer NWOBHM. There is a real melodic rock vibe here. Now the keyboards at the start of this bring a better flavor. The cut drives outward from there with more of a tasty rocking sound. This is killer NWOBHM stuff. This version of the song seems a bit more direct. I like this rendition better than the one from the other show, I think. Somehow this makes me think of Saxon just a bit at the start. It shifts to more of a mainstream NWOBHM sound from there. This song works pretty well, but I wouldn't consider it a standout. I do like the descending pattern later in the number, though. Another that lands more in the range of melodic rocker, this still has some crunch. It's also another in the "solid, but not spectacular" vein. This isn't a big change, but rather another classy metallic rocker. I like the keyboard element on this track. The cut has a real 80s metal vibe, but it works really well. This makes nice use of the balance between mellower and rocking. I really dig the guitar soloing on this cut. A driving hard rocker, this is another that works really well. It has both some accessible hooks and plenty of meat on the bone. More of a pure metal stomper, this is the encore for the show. It's high energy and has a great riff at its core. It has some particularly scorching instrumental work later in the piece. This isn't so much a metal track as it is a melodic rocker. It's a strong piece that works really well. There is definitely an 80s vibe to this. The guitar that opens this is picked and has a great melodic sound to it. The vocals come in over the top of this bringing a bit of a balladic vibe. When it turns more toward power-ballad territory I'm reminded of Bryan Adams a bit for some reason. Yes, this has more crunch than that, but the vocals remind of Adams. This is a tasty tune with an accessible hook. An AOR rocking sound is on the menu here. This is another mainstream rocker for sure. The arrangement is decidedly 80s. The blues rocking riff driving this is great. The vocals don't work as well, though. That said, there is a punky edge to this that really brings some charm. The extended instrumental section includes some fiery guitar soloing. This Hendrix tune gets a fairly faithful performance here. The guitar playing is positively on fire. It would be remiss to not mention the bass work, though. It really is noteworthy. This track gets quite exploratory at times. The majority of this is instrumental. There is definitely a punk vibe to this screamer. The vocals bring a lot of that to it. Again the extended instrumental section includes some exceptional guitar work. The whole band is purely in the zone, though. This is another Hendrix stomper. It's somewhat faithful, as well and really rocks. It is a screamer. This is a full on blues jam completely with harmonica. It's so passionate and tasty. This is one of my favorite pieces here, really. Everything just works so well from the guitar sound to the vocals and the harmonica. If you like the blues, you will love this. Here they take on the Peter Green penned classic. I like this, but not as much as the previous piece. Still, the guitar is exceptional. This has a bit harder edge than Santana's version does. Yet, this is closer to the Santana version than it is to the original. A melodic instrumental, this is another that was originally from the Peter Green version of Fleetwood Mac. It has a great melodic vibe and real smooth sailing kind of feeling to it. This comes in even more old school blues oriented than "Love That Burns" was. This is less of an electric blues rocker and more of a pure blues song. It's not quite my kind of thing, but I dig the guitar fills and the piano. Now, this one comes in more along the lines of the electric blues rocking side of the equation. I'm not a big fan of the vocals here, but this song really rocks. There is an intriguing instrumental break with some organ soloing. The closing section of this is really powerful. The vocals bring a bit of a punk edge to this. The cut is more hard rock with a blues basis. This is the kind of thing that was huge in the 1970s. Here we get a repeat visitor. I don't think I like this as well as the previous rendition. It does have some killer guitar work, but the overall arrangement on the other one was stronger. This cool jam has a lot of space rock in the mix. It is melodic and soaring and one of my favorites on this set. This is an instrumental with some great stuff built into it. We're back into metal territory with this scorcher. It's tastefully rough around the edges and has some things that make me think of WASP. The lead vocals on this work pretty well, but some of the backing ones are less effective. This is probably the meanest version of this cut here. I think the guitar soloing might be the best, too. This is really on fire. The stage banter on here earns a parental advisory. This cut powers out into a mid-tempo metal stomper that really rocks. It's an instrumental that's tasty. Among the fastest stuff here, this rendition of the cut is on fire. The order of business isn't a big change here. This is another meaty metal stomper. There is an extensive instrumental jam at the start of this. It has an almost Jimi Hendrix kind of vibe to it. It works out to the song proper there after a few minutes. I think this is my favorite version of the tune here. It has a great catchy hard rocking sound to it. Not a big change, this is just another effective NWOBHM cut. I really like some of the expressive guitar soloing on this track. I'm reminded of a more metallic Robin Trower. This is another potent metal number delivered in fine fashion. I love the guitar parts on this thing. This is a screaming hot version of the earlier song. I really like this better than that rendition. The sound is a bit rawer for sure, but this is just such a powerhouse. The band gets introduced during the course of this cut. This really gets into some screaming territory, literally. It's a great metal stomper. The closer is frantic and strong as it powers out. That kind of sound holds the bulk of the piece, but it drops down for a short section. Then the guitar screams out with passion in a powerful solo. It's an effective tune and a great way to end this.